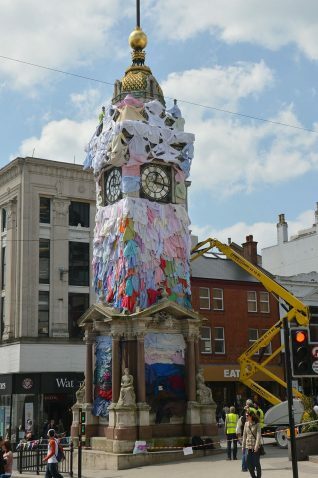 The centre of the city almost came to a standstill today as a new piece called Time Passing By, produced by leading Finnish artist Kaarina Kaikkonen for the Brighton Festival was installed. But rather than being displayed in a gallery, this installation is on the famous Clock Tower. 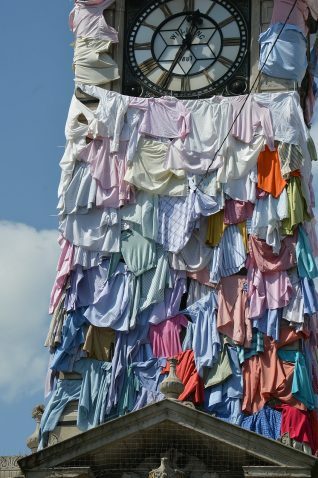 The installation is made entirely from old clothes donated by people in the city. Though ambiguous in meaning, apparently the artist’s works evoke associations of personal loss, collective memory, and local history. It will certainly be interesting to see what Brighton and Hove visitors and residents make of the work. Well, I’ve heard of hanging out your washing on the Siegfried Line , but this is ridiculous. Time to move on. How long will these clothes be left up there – will they just rot when they could have been passed on to people who need clothes or to charity shops? I am thinking of the TIME, and money, it must have taken to do all that. Not my cup of tea but I can see others may find it interesting. I suppose the next step would be make a photo of it so that it could be printed onto T-shirts to make it all last a bit longer through time! I went to Brighton on Tuesday and saw the cherry picker but thought they were taking them down. I think it is dreadful to do this to such a lovely monument and am surprised it was allowed to happen. I sure hope they soon get them down – I agree Ken there are plenty of people who could do with them. The lunatics have taken over the asylum. I felt sick when I saw it. Someone should answer for taking a decision like that. 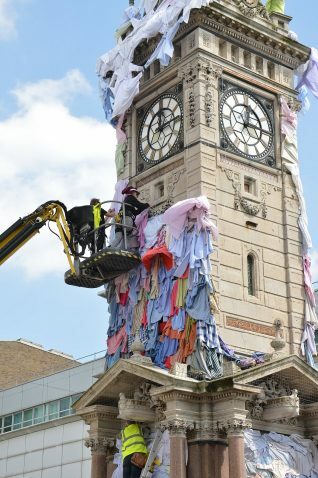 When I first saw the Clock Tower covered in clothes I was reminded of the back drop to Will Young’s forest tour last year – you guessed it- a wonderful assortment of shirts, T-shirts and trousers. Perhaps this was the artist’s inspiration. I like it, it’s fun. Whoever thought up this load of Tommy rot must have been off his rocker. What has happened to Brighton & Hove over the years? Come on you Brightonians, you can come up with something better than this. “The Emporer’s New Clothes” springs to mind! Although, in the Clock Tower’s case, naked would be preferable. Not my idea of art, but I suppose its a bit of fun; glad this clothing isn’t a permanent fixture though!